And I couldn’t leave this without one of my favourite old hymns, In His Time. Here is sung by Maranatha Music. Watercolour is by Janis Cox. Email Janis for information about prints. Today is Sunday Stillness – Do you have a Scripture that spoke to you this week? Please link below. Read the Sunday Stillness rules if you are new here. I would appreciate if you would link only about God’s Word. If you have a linky party that’s okay if it is about the same thing. Please no sales or prizes. I want this to be friendly but I must ask you to abide by the rules. Others want to read God’s Word – and that is what I would like the links to be about. I will take down the links that don’t follow the rules. Thanks so much. Comments always appreciated. Linking with Jumping Tandem, and Scripture and a Snapshot. 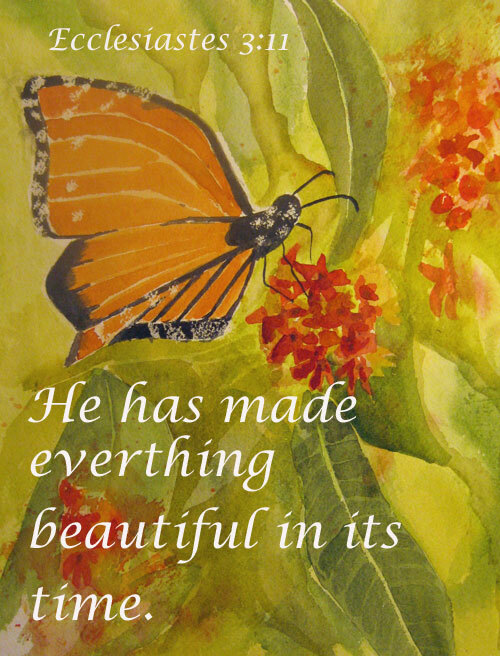 This entry was posted in Prayer and tagged butterfly, God, In His Time, Janis Cox, Scripture, Sunday Stillness, watercolour on March 3, 2013 by JanisCox. It’s a wonderful feeling to be reading your post while enjoying a beautiful spring Sunday. Oh yes – spring is just around the corner. Blessings and thanks for joining us. Another beautiful watercolor … and the words are so inspiring! You make my heart sing today.